FOH engineer Brad Madix (Rush, Shakira, Marilyn Manson, Def Leppard), talks to Waves about his career, working with Rush, and his transition to the digital realm. I played keyboards in bands all through high school and into college. It was in the late '70s and early ‘80s when synthesizers were being used more and more in music. I was always interested in the technical side of things, and with many of the bands I played in, it was left to me to set up and adjust the sound system for the show. I had a substantial keyboard rig, which doubled as a small PA, and I started working mixing a couple bands in my area—cover bands playing weddings and such. I just tweaked the knobs; most of what I did was trial and error. Heck, I think the EQs on the channels were only "Bass" and "Treble"! How did you get into live sound? I was taking music production and engineering courses at Berklee College of Music in the early ‘80s, and spent some time in the studio while I was in college. I did enjoy the studio, but live audio seemed more challenging and interesting to me. There are a lot of obstacles to overcome live, especially regarding acoustics and logistics, and the studio work was often very tedious—I did a lot of editing of voiceovers back when it was all cutting tape with a razor blade! Though I worked recording a couple of bands, most of my opportunities to mix music were live events. At some point in the mid '80s, I got the opportunity to work for a local sound company in the Boston area, so I took it. It felt like a natural transition. I finished up Rush's last tour in July. I’ve been sitting in for Tom Abraham on a couple of Alice in Chains shows, and I recently had the opportunity to mix Carrie Underwood for two shows. Things are always bubbling up. Working with artists from so many genres, do you approach each differently? I suppose the overarching philosophy when approaching any artist is to reproduce their recorded work faithfully, which is not to say "exactly like the record." I mean that you have to capture the essence of what the band has recorded and present it to a large audience, often adding something dramatic, some flair. Of course, every act requires a slightly different approach, especially artists as divergent as Marilyn Manson and Shakira. Manson was very in-your-face, which required really tightening up the dynamic range; Shakira is dynamic, which required a more delicate touch. Though I have only one bag-of-tricks, I do find I use different tricks with different artists. How do you recreate studio sound on the road? Let me give an example: I was mixing Def Leppard years ago. It was early in the tour, and we were doing some sort-of secret shows in clubs in Europe as a run-up to the record release and the big tour. I had worked on the mix for weeks in rehearsals, and had really nailed it, if I do say so myself. One of the first shows was at a fairly crummy club in Madrid, but we had it sounding fairly well, I think. At one point, and I forget which song it was, there was a long spin-off delay. I nailed it perfectly, but the manager leaned over and yelled, "That delay has to be way longer. More repeats and louder!" I told him it was just like what was on the record—exactly! He shouted back, "It's your job to make it sound better than the record!" That particular record, by the way, sold seven million copies. When did you move from analog to digital consoles? I've used digital consoles since Def Leppard's X tour in 2002. Which consoles do you prefer? Lately, I've gravitated towards Avid VENUE systems. I really like the seamless integration of plugins on the platform. What are some of the advantages of digital over analog? For one, anything you need to work on can be brought right up in front of you. It's possible to tweak any aspect of any input or output without taking your head out of the mix. The first time I mixed a Rush show, there were two Midas XL4s strapped together. It was a hike just to put a little high end on the hat! There were also about 60 rack spaces worth of outboard gear, all of which will fit on a USB thumb drive now. Another advantage of digital mixing in the live environment is the ability to quickly reconfigure the desk to facilitate a better work flow: no more fussy patch bays and re-plugging the snake. What advantages are there to using plugins vs. the processors that come with the desk? The processing on most digital desks is pretty powerful these days, to be sure. Plugins impart their own distinct sounds though. Having a number of outboard plugins is like having a well-stocked spice rack. Sure, you can roast a chicken by just sticking it in the oven, but wouldn't it be better with a little extra flavor? Also, I've had it come up when the artist noticed I was using a particular plugin and remarked, "Oh yeah, we used that on the record. I love that thing!" When did you discover Waves tools? I first used the VENUE on a Shakira tour some years back. We were recording a show, and she flew her studio engineer Gustavo Celis in to sit in the truck and oversee the recording, it was all digital recording to Pro Tools. Gustavo was accustomed to working on an SSL, I guess, because he asked the guys to put an SSL channel on every track. Voila! They had configured a 72-input SSL, complete with buss compressor. I suddenly realized how powerful this could be live, and that it could actually be done. What are your favorite Waves plugins? 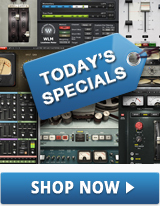 I have four go-to plugins: SSL E-Channel, SSL G-Master Buss Compressor, API 550A EQ, and C6 Multiband Compressor. SSL E-Channel is just a great all-around, multipurpose plugin with great EQ, compression and nice, soft gating. I use it on all sorts of things, but I really like the edge I can put on a guitar with it: cutting, without being grating. SSL G-Master Buss Compressor is great across drums. I pop it in on the drum buss at the start of every tour. The API EQ is great for tonal shaping, and you don't have to be shy about cranking the knobs around. Even with crazy boosts and cuts, it still sounds natural. I love it on bass, but I use it on all sorts of things. C6 is a great problem solver, especially on vocals, since the tone can change radically depending on how the singer is positioned relative to the mic at any given moment. There are four things that happen commonly: something nasal-y or honky in the 800 Hz range, something biting in the 2 kHz range, "plosive" pops down low and tweeter-popping ess-es way up high. C6 can take care of all of them at once, and the two very surgical parametric bands are a huge help. Tell us a bit about mixing Rush. The fun part—as well as one of the biggest challenges—of mixing Rush is that their career spans five decades now, from the late 1970s to the early 2010s! There are several distinct versions of Rush's sound depending on the era, and they play songs from every one over the course of the show. There's a pretty significant difference between the sound of Fly by Night, Moving Pictures, and Vapor Trails, to name just three. One great challenge is to make the show sound like the modern version of Rush, while giving each song the flavor of the era in which it was written. Are you recording or virtual sound-checking the shows? We record every show to Pro Tools, and tune the PA using virtual sound check. This has become such a great tool. Using the tracks to tweak the PA, then playing through the PA to tweak the tracks. It's a gigantic leap from playing a CD on the PA over and over. For example, taking the kick drum—the actual kick drum that I am using—and just listening to the subs alone, I can fine-tune the subs in a way I never could before, and it fits my mix in the venue where we will be performing. While I do recommend playing your favorite tuning music to get a baseline, there's no substitute for adjusting the PA to your own mix. Having committed to digital processing, I try to make the conversion as close to the mic as possible. The stage racks are immediately next to the stage, with digital snakes to FOH, mixing it all together with no reconversion. If I absolutely have to go outboard for something, I go in and out AES. We use the AES outputs of the stage rack and go straight to the amps digitally—minimal reconversion, if any. All of the processing takes place in the amps these days, it seems. They are the final stage before reconversion to analog, then up into the air. Aside from the signal chain, there's a whole lot of networking going on in systems today. While the DSP in the amps is handling the sound processing, it's the network that is carrying the commands. This is getting to be nearly as important as the audio itself. Do you have particular chains you use regularly? These days, I almost always start out on vocals with the API 2500 Compressor, the SSL E-channel and C6. How about bass and master buss? For bass, I really like the SSL E-Channel for compression, but use the API 550A for EQ. Also, I almost always split the bass channel into some amp emulation and blend a somewhat distorted version of the bass back in with the clean tone. The various bass channels get bussed together and run through Renaissance Compressor. As for the Master Buss, MaxxVolume and C6 are always on there these days. Can you share any unusual tips or tricks for using Waves? Using the SSL G-Master Buss Compressor, I like to set up two stereo drum busses and put one instantiation across each. The first stereo pair, I'll compress very lightly. The second, I'll set up something really crushing and pumping, something that emulates FET over-compression. There's actually a "Pumping" preset you can load in that's a pretty darn good start. Mixing the severely squashed drum buss in under the normal drum buss helps bring details of the drums forward in the overall mix. What do you see as your main goal for the audience when doing live sound? As I said before, I want to faithfully reproduce the sound of the band live, adding something along the way. Depending on the band, that might mean a crystal clear, intimate experience, or it might mean a visceral, physical one. In either case, I'm trying to present the band to the audience in a way that's appropriate, coherent, and true to the artist stylistically. Probably my first priority (and often, most difficult job) is simply making it so that the listener can actually hear everything. What advice would you give to a young FOH who wants to move to digital? Approach mixing on a digital console as you would on an analog one. You do not need to wade too deep into the pool to get your feet wet. Set up the desk in a way that feels comfortable, even if that means just 1 – 48 as it's patched in the snake. You can move things around later. Just put things together in a way that's comfortable. Also, you don't need to immediately change your thinking about audio when you start turning knobs on a digital desk. One early experience I had was that I found the graphic representation of my EQ was giving me pause when I turned the knobs. I wound up disabling the feature that brought the graphic up when I started EQ'ing the input. I had mixed for twenty years without a curve showing up on a screen, and I'd always turned the knobs until things sounded right. Suddenly there's this graphic on the screen and I'm having second thoughts. Don't look at the graphic; turn the knobs the same way you always have until you like the way it sounds. The fact is, it's easy for your eyes to fool your ears; some great-sounding EQs can look pretty ugly on a monitor. You should explore every plugin you can get your hands on. Some will immediately impress you, and you will add them to your bag of tricks. Others might not work for you. Don't worry about what everyone else is using; find the tools that work for you and keep them handy.